Is it possible to shut down the internet? CNN recently posted story questioning whether or not the U.S. could shut down the internet the way that Egypt did last week. Egypt’s government did so by oredering the five main internet providers to reroute IP addresses. The U.S. could technically do the same if legislation was in place, but the robust and rhizomatic nature of the system does not allow it to just simply be shut down. The article says that “certain links break and other links are opened”. I am having trouble completely understanding Pachube; nonetheless it is a very powerful concept that allows people across the world to link their data devices. Pachube allows users to “store, share & discover realtime sensor, energy and environment data from objects, devices & buildings around the world”. They claim that it is like the YouTube of data, instead of watching videos, you are watching the data streams occurring all over the world. The attached image comes from Gerald M. Edelman’s Wider Than the Sky (reading for Prof. Mallgrave’s seminar). The book looks at the structure of the brain and attempts to explain human consciousness. 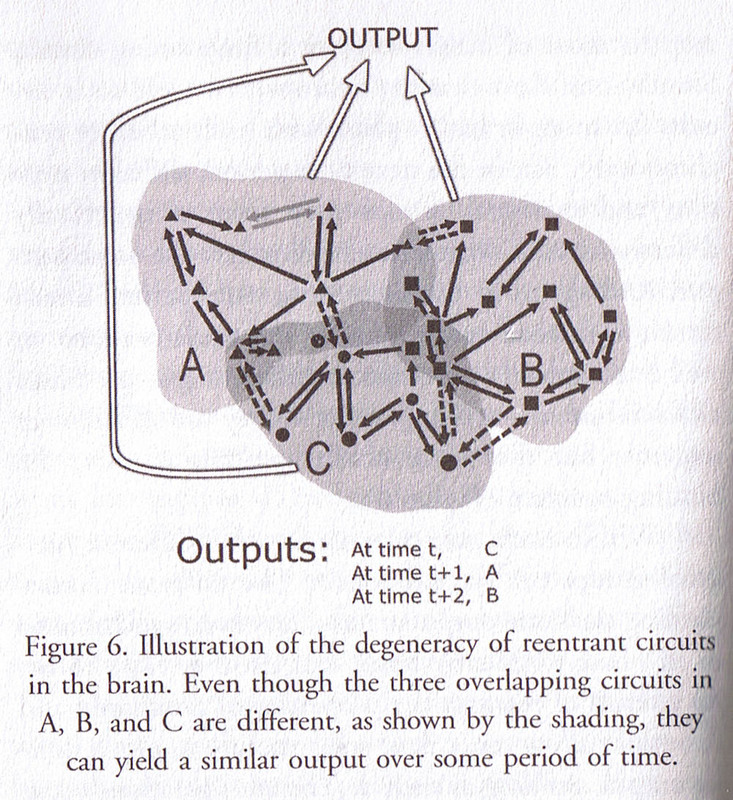 The image diagrams brain functions and suggests that multiple pathways enable similar outputs. Very rhizomatic, no? Considering the key properties D+G identify for qualifying rhizomatic conditons, what are some examples of things or systems, found in our lives or the world around us that act as rhizomes and how would you qualify them as such. It was interesting to hear that the reading by Deleuze and Guattari could or should be read non-linearly. I found it difficult to read it from beginning to end. It is very dense so I had to skip in order to piece it together. The metaphors were helpful. For example, they used the metaphor of an animal burrow to define the concept of the rhizome with its multiple entryways and lines of flight. The link below is a YouTube video which is a 3Dvisualization of the Blogosphere.